I learned I was pregnant, right before New Year’s Eve. So while most people are planning to go on a diet, I had good excuse to continue being on feasting mode. Consequently, my OB GYN supports this. I was expecting she will give me a list of foods to avoid, but instead, she told me that I could eat anything I want. This got me a little worried. For one, they might think I'm already on my due date even before the end of my first trimester. And second, I assumed that pregnant women have a special diet of some sort. I thought coffee, chocolates, soda, sweets, chips even salmon were taboo. 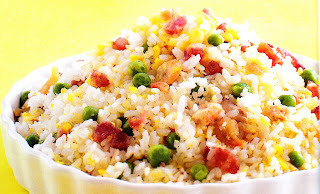 There was one morning that I was craving so bad for Yang Chow Fried Rice. I called up North Park at 8:30 am only to find that their delivery service is still at 11 am. And like a crazy woman, I rummaged our fridge for anything to cook up my own version of Yang Chow. Luckily, I had eggs, spam and frozen peas. That night, hubby can home with 2 boxes of Chinese take-out. Unlike most pregnant women who craved for sweets and desserts, I craved for filling foods, mostly carbs. There was an entire week that I specifically craved for Cibo’s Il Magnifico Pasta (Penne pasta with Gorgonzola, Porcini Mushroom and Cream). The week after that, I craved for anything with cheese - cheese pizza, grilled cheese sandwich, ham and cheese croissant and cheeseburger. I normally would not be able to finish a hamburger by myself, but I found myself competing with my husband. I was eating like a man! As it turned out, we were having a baby boy. I wish I can say that explains my cravings. Maybe there it was the increase of testosterone, I don't know. What I did find out later on in my is that my high carb diet had taken its toll. I had developed gestational diabetes. It was then when I realized that giving in to my every whim will not be beneficial after all. I then had to cut down my portions, avoid simple carbs and monitor my blood sugar every meal. I learned that pregnancy does not give you the license to go on an all you can eat feast. It's ok to give in to cravings, but the rule "eat in moderation" still applies.